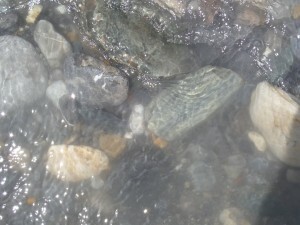 Posted on July 18, 2015 by H. W.
While the veneration and ritual life of Shaligram Stones outside of Mustang District is its own complicated matter of course, the actual experience of searching for and finding Shaligrams in the Kali-Gandaki River certainly cannot be omitted from any account of their meaning and use. As I set out this morning, clad in my canvas field pants and a pair of Vibram KSOs (extremely well-suited to walking around in fast-moving, shin-deep, river water), I found myself a little sad that this would be my last day Shaligram hunting on the outskirts of Kagbeni. The Kali-Gandaki river bed is nearly a mile wide in most places around the village, and as the river slowly meanders back and forth across the valley from bank to bank, it reveals a new landscape of stones and silt each morning. 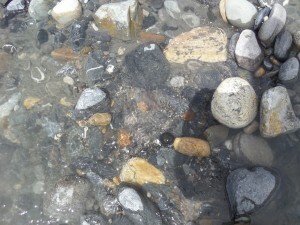 The trick to finding Shaligrams, as I have found, is to find one of many small, shallow, side-streams (particularly ones that are clearly in the process of moving off course or have recently petered out in favor of rejoining the main river current) and walk along them slowly up-river with a sharp eye towards any recently exposed areas. In this way, as one picks their way along through sun-warmed, crystal-clear waters, Shaligrams are slowly revealed to the discerning eye. In Hindu practice, the most important aspect of ritual veneration when it comes to both Shaligram Stones and to other murti (sacred images and statues of Hindu deities used in worship) is the darshan, a Sanskrit word meaning “to see.” But this aspect of “seeing” doesn’t just mean to see the deity physically, as one would when entering a temple (mandir) or shrine, it means to behold the deity as he or she truly is beyond the material obvious to the eye and in return, to be beheld by the deity yourself as well. This practice of seeing and being seen by the deity is thus one of the most common, and most important, parts of ritual practice among observant Hindus and is, also, one of the major driving forces behind pilgrimage throughout South Asia. Searching for Shaligrams is its own kind of darshan. As I walked with particular care not to disturb too much sediment in the water, I noticed two especially important things about the experience I was undertaking. Firstly, the dark, almost inky, black color of a Shaligram Stone was the first thing that tended to catch the seeker’s eye (since it easily stood out against a plethora of grey and brown), the second was the subtle appearance of ripples or spirals (the tell-tale ridges of the fossil ammonite shell) along its surface that indicated that the stone in question might, in fact, truly be Shaligram. But not every stone that might initially appear this way was really Shaligram. In many cases, the refraction of light through the flowing water often gave the impression of such patterns on otherwise smooth stones and the accumulation of silt underneath the current was also often responsible for the appearance of similar looking patterns in the sand that covered the river bed. More often than not, a burst of excitement and a quick scoop of water to retrieve a sacred stone appearing in the river might end up with nothing more than a handful of sand and a plain rock. Experiencing the discovery of a Shaligram Stone leaves one with significant food for thought. Not only are Shaligram Stones considered direct manifestations of God-Himself (unmade by the hands of men) but I would argue that it isn’t just their aniconic (non-human) shape or their natural formation that grants them such a reverent status beyond the ubiquitous murti of temples and roadside shrines; it’s the experience of seeking and finding them in the first place that bestows a sense that these objects come from some other place beyond the industry and understanding of human-kind. It is no wonder that so many travel so far just for the chance of being granted the smallest glimpse of something truly beyond. Whether fossil or deity, the Shaligram comes to us from a place none could ever truly fathom. 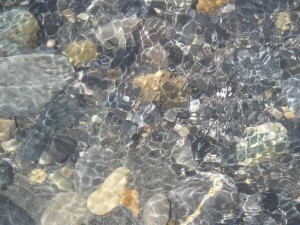 The play of light and water that makes a smooth, river, stone look like Shaligram. Here you can see the ripples that often deceive Shaligram seekers. A Shaligram is Revealed! You can see the round, black, Shaligram near the center of the photo. 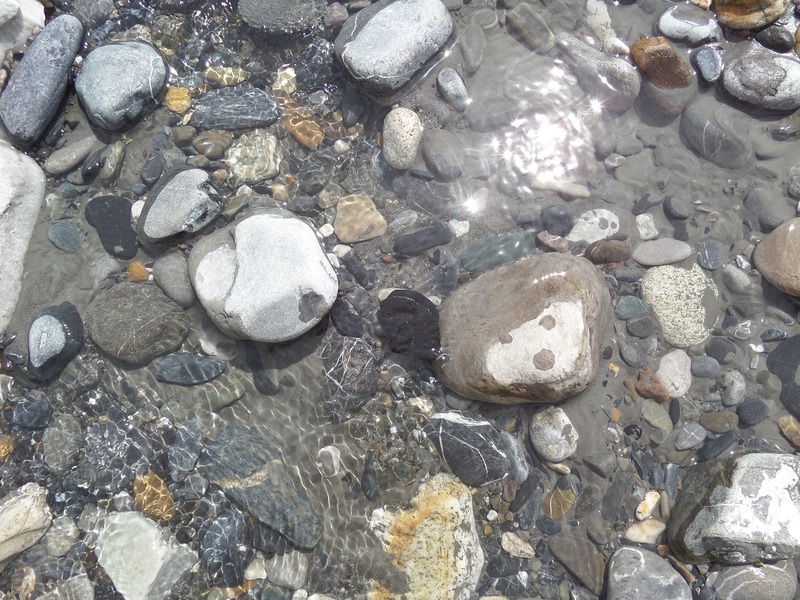 And finally, a Sudarshan Shaligram, with clear chakra markings, appears in the river! This entry was posted in Fieldwork in Nepal by H. W.. Bookmark the permalink. I HAVE SOME STUPID QUESTIONS FOR YOU I WILL BE GREATLY OBLIGED IF YOU CUD ANSWER THEM FOR ME . CAN I DRIVE FROM POKHRA TO JUMSOM AND JUMSOM TO MUKTINATH BY A PAJERO SPORTS SUV. WILL THR BE ENOUGH ACCOMODATION AND VEGETARIAN MEALS AVAILABLE DURING POST 14 DECEMBER ,WHAT WUD BE THE WEATHER LIKE IN THAT TIME OF THE YEAR . SINCE I AM DRIVING MYSELF FROM GORAKHPUR TO MUKTINATH, CUD U PLEASE GUIDE ME ON MOUNTAIN SICKNESS OR AMS ,AND WHAT PRECATIONS I NEED TO TAKE SINCE I HAVE CHILDREN AGED 12 YEARS ,10 YRS ,AND 4 YEARS ACCOMPYING ME ON THIS TRIP. PLEASE TELL ME WHICH IS THE NEAREST POINT WHERE I CUD STAY WITH MY FAMILY FROM WHWERE IT WUD BE EASIER FOR US TO SEARCH FOR SHALIGRAMS ,IS IT KAGBENI OR MUKTINATH . I AM CONCERNERED ABOUT THE ROAD CONDITIONS IN THE STRETCH FROM POKHRA TO MUKTINATH PLS CUD YOU ADVISE ME ON THIS . Hello Rajesh! It sounds like you have quite the pilgrimage planned. I will answer as many questions as I can. 1. Yes, you can drive from Pokhara to Muktinath. You will need to follow the mountain road north/west of Pokhara up to Marpha and then to Jomsom. From Jomsom you will go to Kagbeni and from Kagbeni to Muktinath. 2. I would be a little concerned, however, about the weather. December in the high Himalayas can be very snowy and snowstorms can often be very unpredictable at that time of year. If the the snows are heavy, it will also make it very difficult to drive an SUV through the mountains, especially along the Kali Gandaki River valley. My advice would be to always have a good idea of what the expected weather will be and if there is heavy snow predicted, just be ready to stay somewhere for an extra day or two until it clears. 3. Yes, there is a lot of good accommodations on the way to Muktinath. You can start by staying in either Marpha or Jomsom and then staying in Kagbeni the next day and then Ranipauwa (where Muktinath is) the day or two days after that. There are plenty of guesthouses that can offer vegetarian meals and warm rooms. 4. As for mountain sickness, driving there will actually help prevent a lot of it. The usual problem is that if you ascend too quickly you can experience AMS. The slow drive up will help you to acclimatize as you ascend, so it shouldn’t be too bad. If you are worried about the children however, there are hiking pharmacies in Pokhara that sell medicine designed to stop AMS. You can always ask them about taking some up with you just in case, even if you don’t end up needing it. 5. Searching for Shaligrams, which is always my most favorite part of pilgrimage to Mustang, can begin in Jomsom. Once you have settled at a guesthouse, walk north of the town, past the jeep stand by the secondary school. The river will be accessibly just up ahead. From there, you can search for Shaligrams nears the water (be mindful of the children though! The streams can been very fast moving and unexpectedly deep). I find, however, that the best place to search for Shaligrams is near Kagbeni. I often stay in Kagbeni several days for this reason. Once you arrive in the village, you can reach the Kali Gandaki River from almost anywhere and the best places to search are north of the village near Tiri village. Respected madam , we had been to muktinath on 29 th March 2018.were there till 31st.but due to rain n heavy wind couldn’t go to kagbeni and eklebati.so,we are planning to visit on October 27th 2018.pls let us know about the weather , rain and wind.Also about the water level in gandaki. Will it be possible for us to search for shaligrams.pls guide us. Sir, it is said that one should not take a shaligram from the river itself. That ones are like children. Wich means; Not grouwen up. So, thjat shali is having little power. Only search from the dry banks. You agreer with that stements from locals ? The usual understanding is that any Shaligram that appears to the devotee, either on the banks or in the water, has been born out of the river and has found the devotee for the purpose of beginning life with family and community. I am not familiar with a restriction on Shaligrams in the water as many sadhus, gurus, and devotees get them from the river. They are more likely to appear on the dry banks and if there is a concern, you can certainly only take them from there, but it is not usual for Shaligrams to be taken from the river directly. Additionally, most Shaligram specialists are pretty clear that no Shaligram is less realized or less powerful than any other. Shaligram is always Shaligram. It is possible to camp along the Kali Gandaki, but I wouldn’t recommend it. The high winds at mid-day could become a serious problem for you if your tent is not fully anchored, or is anchored in the sandy banks. However, a few of the villages actually have designated camping spaces available with stone walls around them to protect the area from wind. Ranipauwa (near Muktinath) has one such larger space and you can always ask the trekking checkpoint where they are in Jomsom and Kagbeni. Yes, absolutely. There are no local restrictions on going to the river and looking for Shaligrams. It is, in fact, what most pilgrims do and the local people are completely familiar with it. Most don’t come down to help though, unless you’ve hired a guide. Many have Shaligram collections of their own, however, and may have some in their shops, teahouses, or restaurants if you are looking for one in specific. Thanks for reply. What would be the right time to visit so that the river is not in full flow and the weather is also moderate,(as I come from tropical place Chennai,) so that we get best chances to find saligrams. Sorry for many questions. The best times to visit are either in the mid-Spring (April/May) or in the fall (late August/September). That way, you don’t run into the danger of encountering a full monsoon in the valley, which can be rough. The river is also at a moderate level at that point, so you should easily be able to search for Shaligrams in the riverbed and along the banks. Good luck!